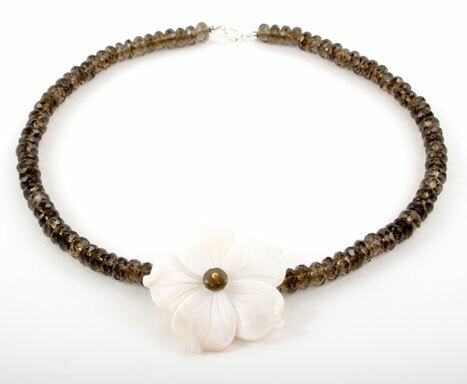 Faceted Smokey Quartz Flower necklace 16 inches long made with faceted Smokey Quartz rondelle beads. The necklace is completed with a beautiful 40cm Mother of Pearl (also known as River Shell)carved flower situated on the left of the necklace. The faceted stones in this necklace reflect the light beautfully and are a beautiful coffee colour. Finished with a sterling silver clasp.